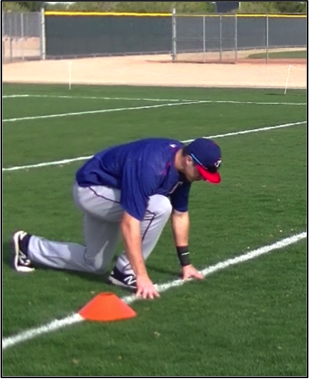 The kneeling start is an effective exercise to teach proper body alignment, force production and recovery angle for the trail leg when accelerating from of a stationary start in the sagittal plane. 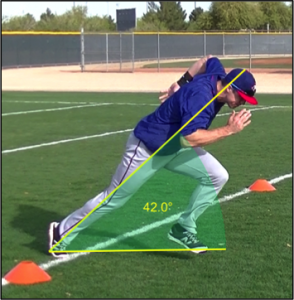 When an athlete can effectively accelerate in the sagittal plane, he is taught to accelerate from a stationary start in the frontal plane using a drop step or crossover step and then to accelerate in multiple planes when moving. 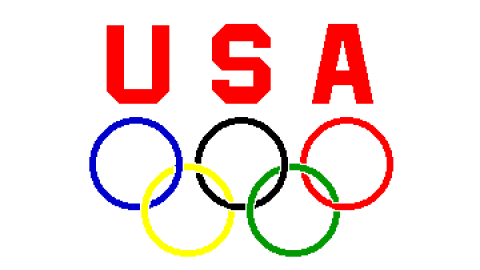 To set up for the kneeling start, the athlete squats down with the right foot on the starting line and the left knee even with the heel of the right foot. 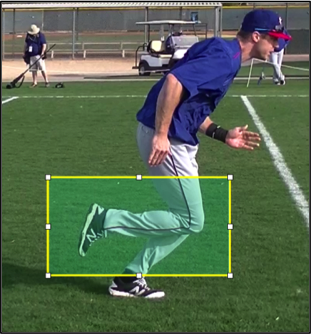 Both hands should be on the ground to help stabilize the body and left (back) knee should be 1-2 inches above the ground (photo 1). 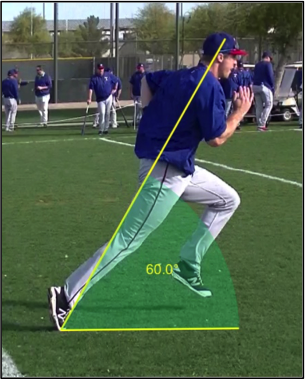 The athlete will then extend the hip of the right (lead) knee slightly to raise his left knee and center of mass about 2 inches and put the joints of his body in proper position to apply max force. The left hand will remain on the ground for stability and the right hand will move back and up so that he can drive it forward upon take-off (photo 2). 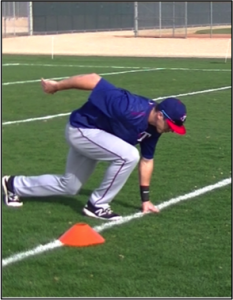 The athlete will hold this position for 1-2 seconds, set the core and then drive forward off the right (lead) leg. 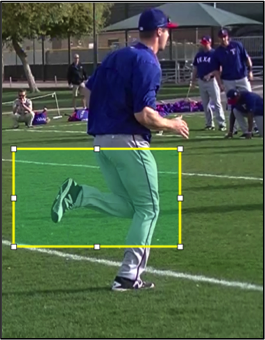 As he drives forward, he will throw his right arm up and forward and left arm back to help propel him forward (photo 3) and drive his hips over his right (lead foot). The athlete should take-off from an angle of approximately 450 (photo 4). 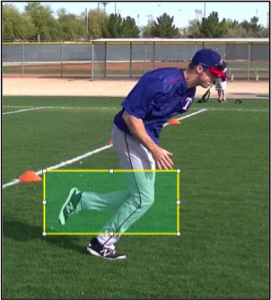 After take-off, he should continue to drive forward for 5-6 steps before moving to a more upright posture. The proper body angles for the first three steps are illustrated in Photos 5 – 7. 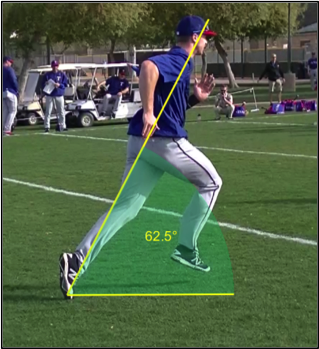 The heel of the recovery leg should remain low on take-off and gradually rise as the athlete moves forward. Athletes who demonstrate proper acceleration mechanics keep the heel of the recovery (back) foot below the knee of the lead leg throughout the acceleration process (photos 8-10). 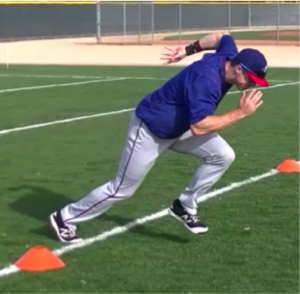 When the heel rises above the knee of the lead leg, the athlete begins to cycle his legs and starts to transition from acceleration to sprinting. 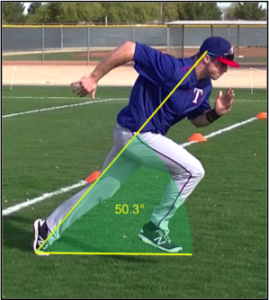 The longer an athlete can accelerate the greater his potential to reach top speed. In photo 11, the heel of the recovery leg is higher than the knee of the support leg indicating that the player has started cycling his recovery leg. Once this occurs, the ability to accelerate is significantly reduced. Start with 5 reps of kneeling sprints; one set with the right foot forward and one set with the left foot forward. Gradually progress to 3×5 with each foot forward. 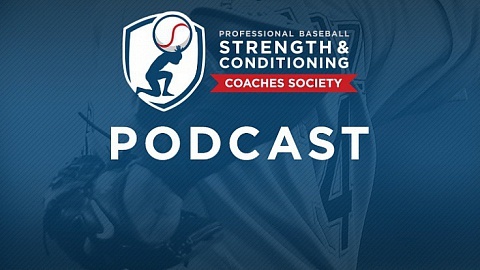 Jose Vazquez, PT, CSCS is Head Strength and Conditioning Coach, Texas Rangers. Gene Coleman, Ed. 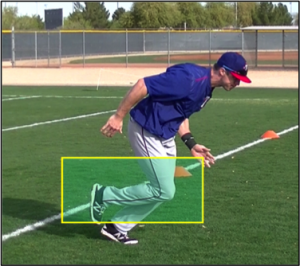 D, RSCC-E, FACSM is a strength and conditioning consultant for the Texas Rangers and Professor in the Exercise and Health Sciences Program at the University of Houston – Clear Lake.